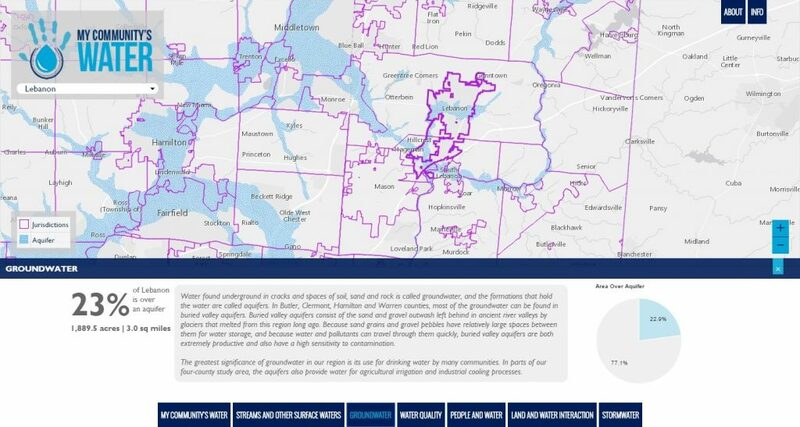 My Community’s Water is a web-based interactive tool for geographic information system analysis (GIS) of water resources in the 122 local political jurisdictions of Butler, Clermont, Hamilton and Warren counties. It can be accessed here or through the website for Ohio·Kentucky·Indiana Regional Council of Governments (OKI). Related knowledge is addressed in a descriptive profile written for each local political jurisdiction. Staff members of OKI’s Regional Planning Department, Geographic Information System Division and Communications Department jointly prepared My Community’s Water. The State of Ohio funded the project and Ohio EPA administered that funding. In addition to informing the public, My Community’s Water also serves as Chapter 9* of the Water Quality Management Plan for Butler, Clermont, Hamilton, and Warren Counties in Ohio (OKI, 2016). Under Section 208 of the federal Clean Water Act, the Water Quality Management Plan is OKI’s main guidance document for its role as a federally designated regional water quality management planning agency.